Does Specialists accept my insurance? Steven Atchison, MD joined Orthopedic Specialists of Louisiana in 1999. Since then he has led the way in positioning Specialists Hospital Shreveport as an award winning and nationally recognized facility for total joint replacement surgery. Dr. Atchison specializes in disorders of the knee and hip. He was the first surgeon in Louisiana to complete the Mako Robotic Partial Knee Replacement in July 2010 and the first surgeon in Louisiana to complete the Mako Robotic Total Knee Replacement in December 2016. Further, he is one of handful of surgeons in the country to successfully train and perform the Direct Superior Approach- Hip. 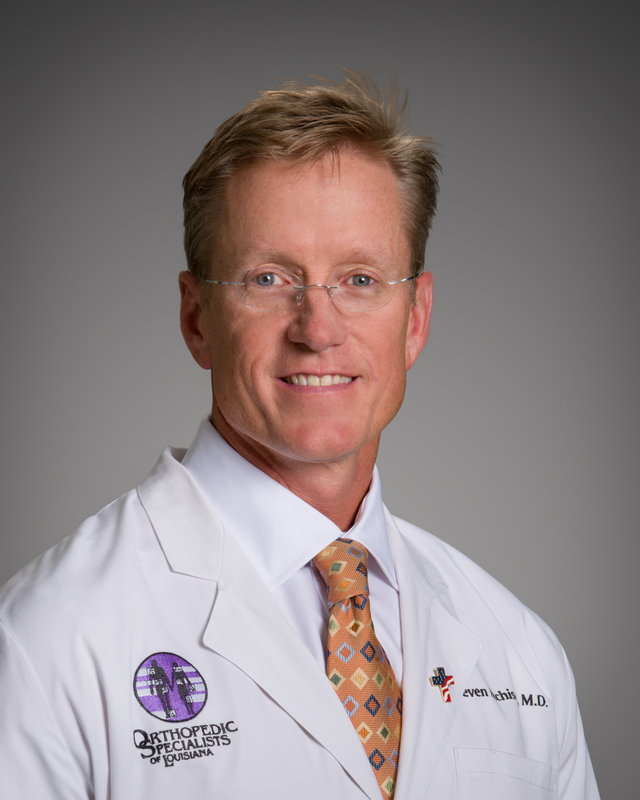 Dr. Atchison uses cutting edge robotic, minimally-invasive, and muscle sparing surgical techniques that are designed to help his patients return to their active lifestyle as soon as possible after surgery. His approach in surgery is to focus on soft-tissue preservation which allows for an expedited and more comfortable post-surgical recovery period, reduces the amount of time patients are required to stay at the hospital, and, in some cases, enables patients to complete their total joint replacement procedure on an outpatient basis. Dr. Atchison believes in a personalized approach to patient care. He truly believes “you get out, what you put into your surgery,” and wants his patients to go into surgery with realistic goals and expectations based on his patients’ personal goals and expectations. He and his team maintain a high level of accessibility to their patients insuring that they can address and questions or concerns that may occur before, during and after a procedure. He is a consultant and educator for Styrker Orthopedics. Surgeons travel from around the world to learn more about Mako Robotic Total/Partial Knee Replacement and the Direct Superior Approach from Dr. Atchison at Specialists Hospital Shreveport. Dr. Atchison and his wife, Sharye, are the proud parents of four children and are active in their church and community. He is an avid golfer and enjoys the outdoors with family and friends. Please note this does not guarantee your date. If we cannot match your date, we will work to give you an appointment date as close as possible.